These spring rolls were really fun to make. 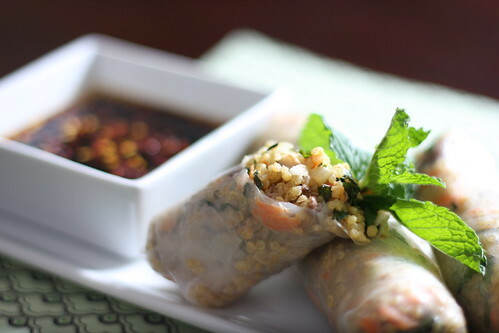 Pairing fresh mint and raw tahini with quinoa created a rich and clean flavor that worked well with the smooth texture of the spring roll wrapper. I make this lime-soy sauce often to to go with a lot of fried dishes—but it also tastes great with this mostly raw dish. Make the sauce by whisking together the first seven ingredients. Set aside. In a medium-sized saucepan, bring the 1 cup of water to a boil, and add in the quinoa. Lower the heat to a simmer and let it cook for about 15 minutes, stirring occasionally, until the quinoa has absorbed most of the water. Remove from the heat and add in the tahini and salt. Mix well. In a small skillet, saute the shiitake mushrooms in some olive oil over medium heat until softened, about four minutes. Transfer to the quinoa. Next, saute the shallots until softened, about five minutes. Transfer that to the quinoa. Wipe off any extra oil from the skillet and throw in the raw cashew pieces. Saute until they are slightly toasted, about three minutes. Add that, along with the carrots and mint, to the quinoa, mixing well. Place in a covered container in the refrigerator until cooled completely, about one hour. To assemble the spring rolls, I use a large circular baking sheet. Run the spring roll sheets under some warm (not hot) water for about 30 seconds and lay it down on the baking sheet. Spoon about 1/4 cup of the mixture into the center of the spring roll wrapper. To roll them, simply take the edge that’s closest to you and fold it over the mound of quinoa mixture. Gently tuck it under the mixture, ensuring a tight fold. Roll it away from yourself just a bit, ensuring that the wrapper is tightly folded around the mixture. Now fold the sides in and continue rolling it away from you until its a nice cylindrical shape. Before you proceed to rolling the next one, wipe off any moisture on the baking sheet. These will hold up very well in the refrigerator for about two days. This is really pretty, elegant and light. I have to say this is my new favourite blog and I am not just saying that. Keep doing what you are doing once u are enjoying it! Will try this when I source rice paper this weekend…I know it is around. Will tell you how it went. I love this, they look delicious!